Australian Ray Thorpe has become a legend in the alternative herb-sphere. 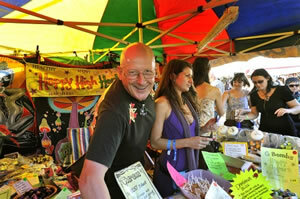 In 1993, entrepreneur Ray opened his first "Happy Herb Shop" in Nimbin, Northern New South Wales. This passionate crusader for herbs and drug law reform has since then opened another 43 stores in Australia and overseas, written his own book called "Happy High Herbs", which is on its sixth reprint selling more than 30,000 copies, and is achieving a lifelong dream of assisting young people with their own dreams and mixing his passion for plant and drug law reform with work, travel and pleasure. Born in 1947 in Canberra, he grew up, became a father and worked and lived in Melbourne. In 1990 he decided to get out of the corporate world and with his partner Elizabeth, shifted to Uki in the northern rivers area of NSW. He started a herb business to promote the cause of herbs at festivals and markets around the Byron Bay/Nimbin region.